During the fall semester of my junior year, I took an Islamic literature course at the University of Georgia with Dr. Godlas. One day, Dr. Godlas asked the class to divide themselves into groups of three and discuss the reading from the previous night. 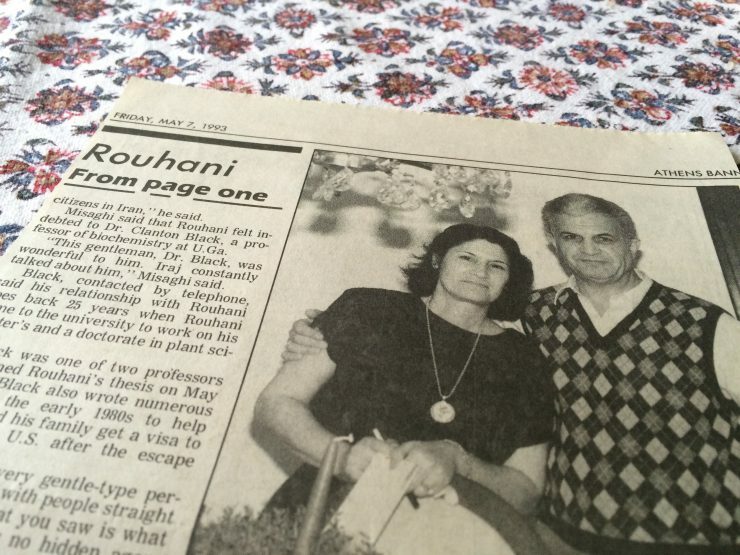 Nasrin Rouhani, an Athens resident who occasionally took classes at UGA, just happened to be in my group. Halfway through the group discussion, Nasrin expressed her opinion about the piece of literature and briefly mentioned her Iranian heritage. As an Arabic Major, I was fascinated with all things involving the Middle East. I prodded her about her life in Iran and eventually learned that she was in Iran during the 1979 Revolution. At this point, the discussion shifted from Islamic literature to Nasrin’s past, much to my other group members’ chagrin. After class ended, I caught Nasrin before she left and asked if she would be interested in talking about her experience with the Athenia team. She accepted the offer and, a few weeks later, sat down with me, Katie Andrew, Nick Mallis, and Jenny Alpaugh to record her story. Unsure of what to expect, we started recording her story and prepared questions to ask intermittently. To our surprise, Nasrin poured out an amazing story about her life in Iran and the events that eventually led to her escape from the country she called home. Because of the story’s complexity, we were not able to collect all the information during the first interview, but we knew this was a story we wanted to pursue. Unfortunately, soon after our first meeting, lots of changes took place within the Athenia staff and Nasrin’s Story took a back seat. A year later, I became Athenia’s executive producer and my first priority was to finish Nasrin’s story. In early 2016, we invited Nasrin to the WUGA studios to finish her story. She patiently sat with us, answered our questions, and talked about her experience. We finally had her story down, but we were hardly out of the woods. The toughest part, in my opinion, came down to the production of the story. I had to find a way to craft the story in a cohesive manner that captured the attention of an audience who didn’t know Nasrin personally. The music, pauses, sound quality, sound mixing, and scripting of the piece took the most work, but eventually became the skeleton that kept the story together while Nasrin’s voice acted as the organs that drove the story forward. After a lot of editing, late nights, and email exchanges, the story was finally ready to air. We decided to air it on July 4th, even though some people might be watching fireworks when it aired. On a day when we celebrate America’s history and beauty, we must remember where that beauty and vibrant history comes from: its immigrants. We hope that Nasrin’s story will provide insight into the lives of refugees in America and what can happen when someone is given a chance in the land of opportunity. You can listen to Nasrin’s story here or at the Athenia Stories page.